A few words about us…. Our Diving Center was established in 2003 in Patras. Up until today, we strive through our love for scuba diving to offer the best possible services to beginners as well as to advanced divers. Our diving center is licensed and certified in Divers Training, Accompanying certified divers as well as in equipment rental. At the same time we are qualified trainers from the well-known organisations PADI & ANDI at all levels of training. Since 2003, our Diving Center is housed in 62 Agia Sophia Str. in Patras, while during the summer period you can also find us at the ‘Long Beach’ Hotel in Longos, Aigio. When we are not under water you can reach us at any time of the day, every day and all year long either at our place or at the telephone number +30 2610 454714 or at the e-mail:info@ioniandivers.gr. For our beginner friends who want to live the experience of scuba diving, we offer you unique moments under water in the sea bottom feeding small fishes, playing with octopuses and taking one-of-a-kind photos. For our little friends we offer special programs, both in the pool and in the sea, that will be unforgettable. 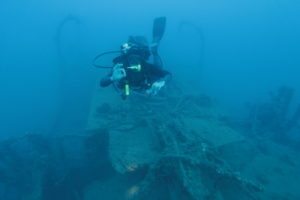 For advanced divers we offer the possibility to dive off our boat into the most beautiful spots – shipwrecks of the Gulf of Patras and Gulf of Corinth and the chance to experience unique emotions. 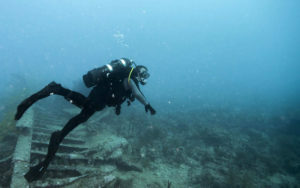 Finally, they also have the opportunity to dive in fish farms along with tunas, sea turtles, seals and dolphins. Our Diving Center offers you everything. From a boat, to the accompaniment of experienced instructors and down to the simplest piece of diving equipment. We can also provide any gas mixture that our client needs from normal atmospheric air, Nitrox mixtures and Trimix mixtures. The only thing you need to have with you is a swimsuit and real zest for scuba diving. So, we are waiting for you to experience together unforgettable and safe scuba diving moments!